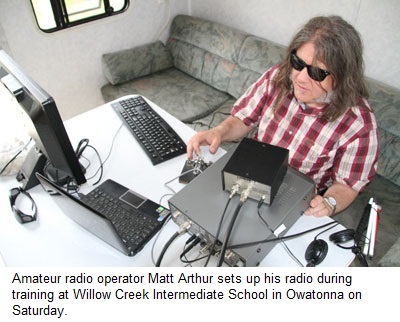 Amateur radio operators were involved in a training exercise for a 24-hour period at Willow Creek Intermediate School in Owatonna on Saturday and Sunday. "To us it is a lot of fun," said Mike Conrad, who helped coordinate the event. "It is work, but it is enjoyable. It is good practice for us. We hope to show the public a little bit about amateur radio and what it can do. It has grown tremendously." There are currently approximately 100 operators in Steele County. Tom Karmauskas, who has been involved in Steele County for more than a decade, agrees with Conrad that the hobby is fun. He has been an amateur radio operator for more than 30 years. Currently, he is involved with Steele County Emergency Management. "Amateur radio is part of the emergency operation plan for Steele County Emergency Management," he said. "Luckily this county has never had a communication emergency." The exercise started at 1 p.m. on Saturday and concluded at 1 p.m. on Sunday. The amateur radio operators stayed on the air throughout the evening. "This is an exercise to get us out of the house, bring our radios and antennas and practice setting up where we wouldn't normally do," Conrad said. "If we did need to do it we would have a little practice in doing it. That's the drive behind this." Even if the amateur radio operators only conduct the training once a year, it has an impact, Conrad said. "Getting our antennas set up at home, they're established and we don't have to mess with them," he said. "Here we come out, put up the antennas and generate power to run our radios. It is different than operating from home. This is more what would happen if we were to get called out anywhere. We wouldn't walk into a pre-established radio station."